Wildlife in Africa and Cameroon, in particular, is under severe threat as appetite for snakes, pangolins, monkeys, ape, and other threatened species grow. As these consumption patterns continue unabated; it places considerable stress on wildlife already facing daunting odds from multiple illegal activities and practices. In late June 2016, I set out to investigate the increasing demand of bushmeat consumption in the main cities of Cameroon. The biodiversity-rich town of Bertoua, the capital of the East Region of Cameroon, located about 350 KMs from the nation’s capital, Yaounde, seemed an obvious choice for me. At about 11 am on June 28, dwellers of the main market of the town gathered around an unusual scene of screaming women. Through the noises of their voices which drowned some low-toned bars of old school Makossa music emanating from old tattered speakers of a pub in which they were standing, one could only hear their grievance through keen selective attention. In between a semi-circle they had formed and shelves that harbored assorted boozes, stood a speechless journalist, photographer, and a fixer. We were working on a report on the illegal sale and consumption of bush meat, with the focus on endangered species. Many left their sheds and gathered around the bar. As the majority of the occupants supported their fellow market women, enjoining more aggressive tones and threats, we finally agreed to one of the numerous and uncoordinated suggestions – which was to hold us hostage until the police arrive to arrest us. Three police officers emerged through a footpath behind the pub few minutes later. They struggled to calm rising tempers and lead us to the police station located less than 400meters away. Opposite the police station was a major sales point of bush meat in the market. And the sales went unperturbed you would imagine most of what they sold was legal. Once at the station, the chief of the police station, Valentine Ngeng ordered us to delete all the photos taken in the market. “Delete everything and show them that their photos are no longer in the Camera. You might undermine what happened back there, but you should know it could have degenerated into an uncontrollable riot,” the Chief of Station said, asking the women to watch and make sure their photos are deleted. “Leave the women alone. Is there anything legal in this country?” one of the officers responded when I dared to question why the police should be supporting people involved in an illegal activity. Moussa Oumarou, another police officer at the station, asked if we had the authorization to take photos in the market. “It is not your job to judge whether their activity is legal or not,” he added while other officers made fun of the situation. The women returned to their sheds after the incident and went along with their businesses as usual. The bush meat sheds and the meat thereon are prominently displayed in a way that passersby would inevitably see freshly killed and still bleeding monkeys of different species, dried pangolins, deer, antelopes, boars, monitor Lizard, and porcupines. A few kilometers from the Bertoua Central market is another sales point for bushmeat. It is known as the Denier Poteau Mokolo neighborhood. In the early hours of June 29, 2016, two women spread out their stock on a table in an open hut by the roadside in the neighborhood. As is the case with these markets, they offer their clients a variety of bushmeat species including dried pangolins, deer, antelopes, boars, monkeys and this day they had a dead turtle for sale as well. 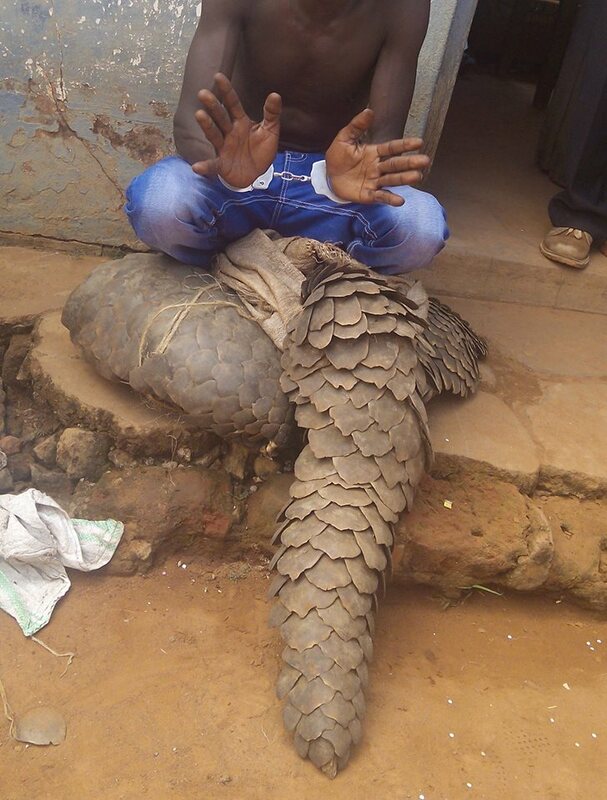 One of them tells InfoCongo that pangolins sell for circa 6000FCFA (USD$10) a piece. You can get a whole dried monkey for 4000FCFA (USD$7) or even 5000FCFA (USD$9) depending on size. But the porcupines are the most expensive. It will cost you about 7000FCFA (USD$14) to get one. As she spoke, a bus with no registration number caught her attention. She stopped talking. The driver pulled down what looked like a coffin from the carriage of the bus. Out of the box came emerged several pieces of bushmeat. A few meters away was a military truck of Cameroon’s foremost elite force known in as the Rapid Intervention Battalion. Next to the pickup truck was another table on which various types of bush meat were displayed. But none of this was dissuasive – business went on as usual. An official of the East Regional Delegation of the Ministry of Forestry and Wildlife says though they carry out regular raids in such markets, he had suggested that emphasis be placed on poachers. “I have been working here for three years. Each time we go out confiscating bush meat, it hurts me so badly because the animals are already dead. We need to prevent the killing of these animals,” he said, pointing to wires, and armor confiscated from poachers. Marcellin Pandong, the region’s delegate for the Ministry of Forestry and Wildlife told InfoCongo that the habit of eating bushmeat is enshrined in the socio-cultural fabric of Cameroonians, especially those of the East and South regions. “You may have a few exemptions but most people here eat every specie of bush meat,” he says. Mr. Pandong said poachers whose principal source of income is the sale of bushmeat will always kill animals. “When they go out hunting for the market, hardly do they care about the species they are killing. All they know is that there is a ready market for their product, and they will continue supplying as long as there is demand,” says the delegate. Cameroon’s 1994 Forestry Law, however, protects the rights of the indigenous population to consume meat from their community. The law limits the native population to hunt for home consumption. “People are not forbidden from setting traps in the forest for rat moles and other unprotected animals. But you will not see anyone carrying home a buffalo or elephant from an ordinary trap. 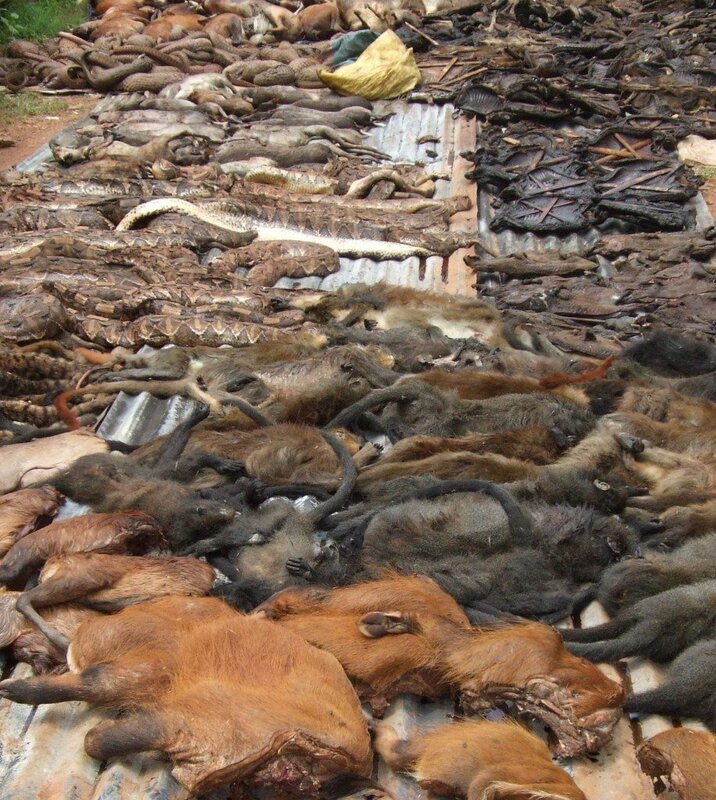 The mass killing and commercialization of all species of bush meat is forbidden”, the forestry and wildlife official said. 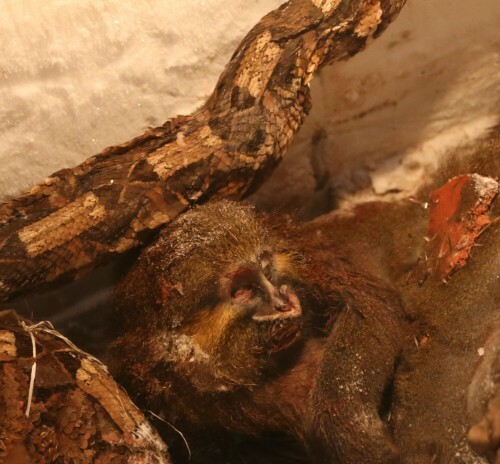 Besides transporting bushmeat in the guise of corpses, traffickers have varied ways of concealing their goods. Eric Kaba Tah, Deputy Director of the Last Great Ape, LAGA, a Cameroonian NGO explains that “endangered species including chimp and gorilla are trafficked without officials paying much interest because more attention is placed on traffickers of ivory.” He informed infoCongo that two men aged 35 and 25 who usually supplied ape meat to buyers in Abong Bang and Yaounde were arrested in possession of twelve chimpanzee skulls on June 9, 2016. They were traveling from Somalomo, a locality near the Dja Reserve, a UNESCO World Heritage site. Meanwhile, along the Bakassi Street, near the Sangmelima Central Market in Cameroon’s South Region, bushmeat vendors appear to be more frightened by the sight of Cameras than the forest law. As early as 6 am every day, poachers pull over one after the other near the market to a crowd of ever-impatiently waiting for women. The early hours of July 4, 2016, were no different. All the women rush to the trucks as the poachers arrive, each of them bustling to grab an animal. Cameroon’s wildlife law stipulate that any person found at any time or any place, in possession of part of a protected animal shall be considered to have killed the animal. 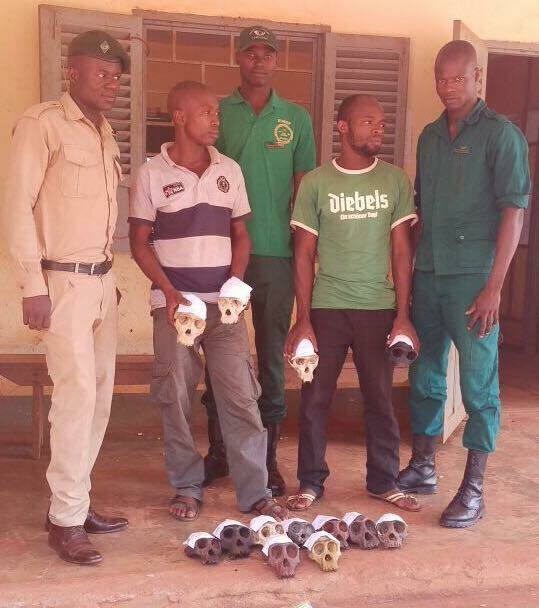 Penalties for the killing of a protected animal range from 3-year imprisonment to ten million francs CFA (USD$20.000) fine. The law provides that those penalties shall be doubled in case a judicial police officer commits the offense. Vendors at the Nkolndongo local market in Yaounde argue that officials of the Ministry of Forestry and Wildlife periodically storm the market and seize bushmeat but let vendors go free. Consumers are also not arrested. There has never been a case where one is stopped from eating or arrested because eco-guards found them in possession of a slice of pangolin on a plate. People who visited the so-called former bush meat section of the market in the early hours of June 30, 2016, would have witnessed a macabre scene of young men peeling scales off the skins of pangolins and unplugging quills from porcupines. Next to them stood a display table with pangolin scales for sale and a mat on which were laid over twenty dead piebald pythons, also for sale. Bush meat dealers, for fear of arrests, no longer display meat by the roadside at the Nkolndongo market. Near the sidewalks of the street, women sell live fishes out of huge containers of water. A few meters from the market, near the area where quills and scales are ripped off porcupines and pangolins, are men and women selling bush meat. “I can make you a good offer for deer and antelope. We also have monkey and pangolin meat at the back in different sizes” a vendor tells infoCongo to attract attention and beat competing vendors. We gathered that their worst fear is losing the meat as it is their main source of livelihood. Some of the cautious vendors who own restaurants near the market, stock the animals in deep freezers meant for drinks. “We have lost our stocks to forestry and wildlife officers several times. So we are becoming cleverer. Even suppliers park their vehicles several meters away from the market, and we go there one after the other and buy what we want,” one of them tells InfoCongo as she pulls out by the tail, a monkey from her refrigerator. “If my colleagues out there see you with a camera, they will fall on you like bees. They have been victims to spies from the forestry ministry, and that has made them violent towards anyone suspicious,” she cautioned. “I only let you in because I trust Ndongo who brought you here.” The bush meat sold at the Nkoldongo market, in the heart of the city, is smuggled into town from the East and South regions. 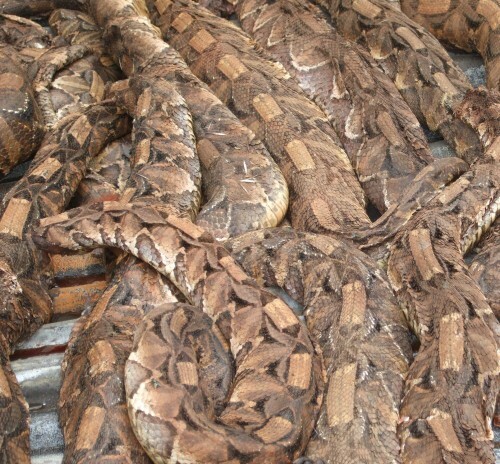 "Eating Snakes Makes You Wise and Alert"
Yaounde city dwellers desiring to eat out of the home, either go for classy restaurants or what is commonly called ‘tourne dos’ in French, loosely translated as turn your back. The latter refers to makeshift sheds by roadsides, car parks or behind Ministerial buildings where people sit and eat with their backs facing the road. 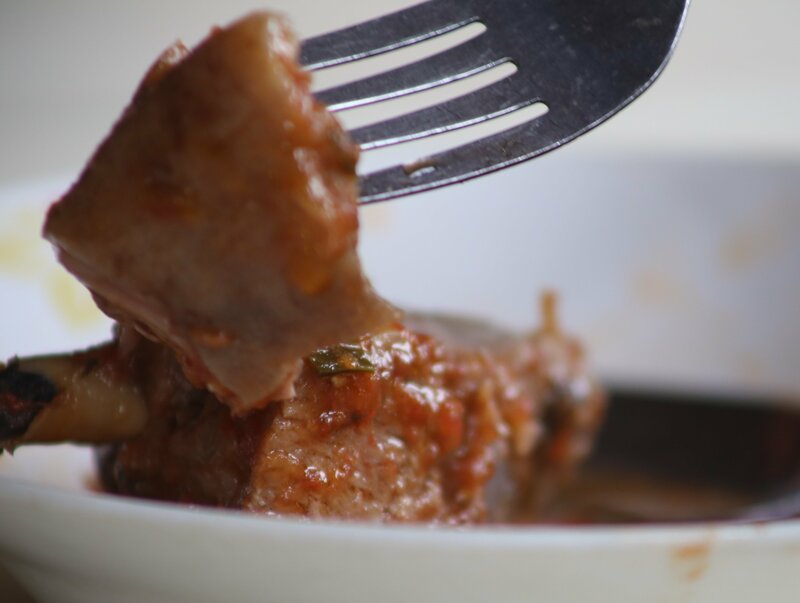 Classy restaurant eaters and people who can only afford ‘tourne dos’ have a modicum of choice when it comes to picking where to ‘legally’ eat illegally commercialized bush meat and endangered animal species. Average Cameroonians who can afford eating bush meat in Yaoundé would, for the most part, visit the Gare Routiere de Mokolo, a car park of vehicles plying neighboring villages. The park has a ‘special’ section of more than 20 huts for bush meat. Every day the menu of each restaurant is modified according to what its owner was able to get from the bush meat market or hunters who supply them whenever possible. The menus usually include Pangolin, Boar, Boa, Serval Cat, viper, pythons and some rare fish species. 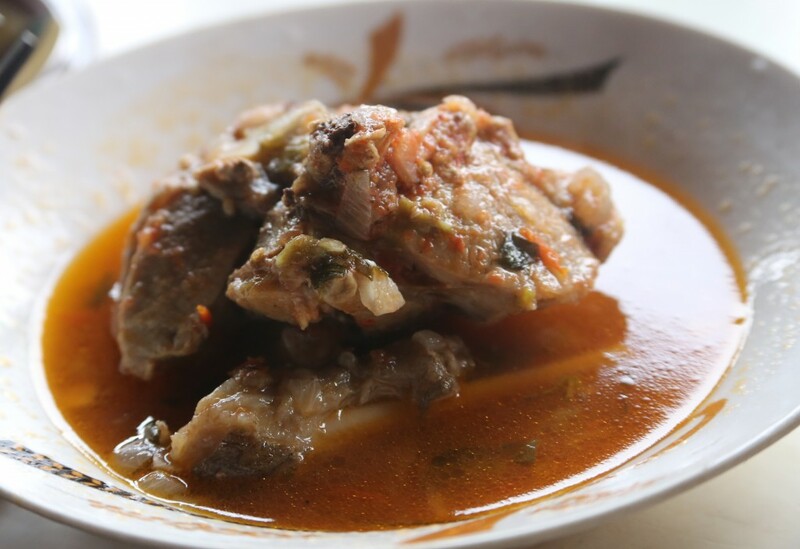 A piece of any of the animals and snakes, usually cooked in tomato stew or pepper soup is served with boiled starchy tubers and plantains at the cost of 1200FCFA (USD$2) a plate. Sizes of meat differ according to the rareness of the animal. People who can afford classy restaurants visit the Bois d’Eben restaurant, located some 40 meters near the headquarters of the Central Bank of Central African States (BEAC). Here the same sizes or even smaller sizes of bush meat are sold for 5000FCFA (USD$10). 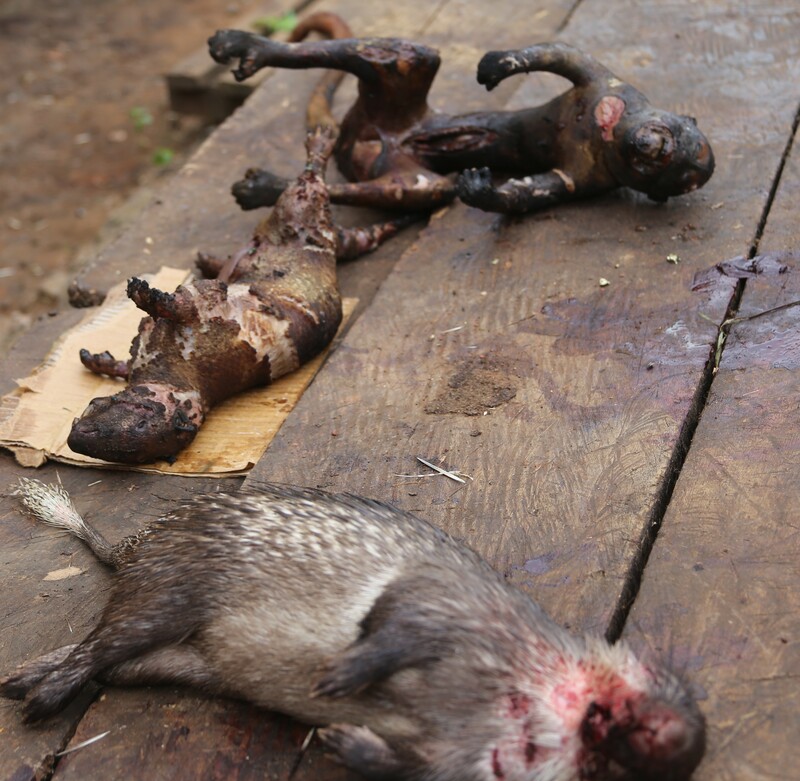 A report by the Cameroon-based In Defense of Animals-Africa (IDA) NGO says bushmeat in urban markets in Cameroon is not bought and consumed out of necessity by hungry people. “Demand is created by cultural preference. In fact, as certain species like chimpanzees and gorillas have become rare, their meat has become very expensive. Ape meat is now a delicacy of the wealthy elite, signifying status for those who serve it at banquets and other formal gatherings.” the report found. Hardly would one not find rare species at a Banquet organized for or by top ranking officials of the Ministry of Defense. Bushmeat is a local delicacy not only for the poor for the governing elite as well. 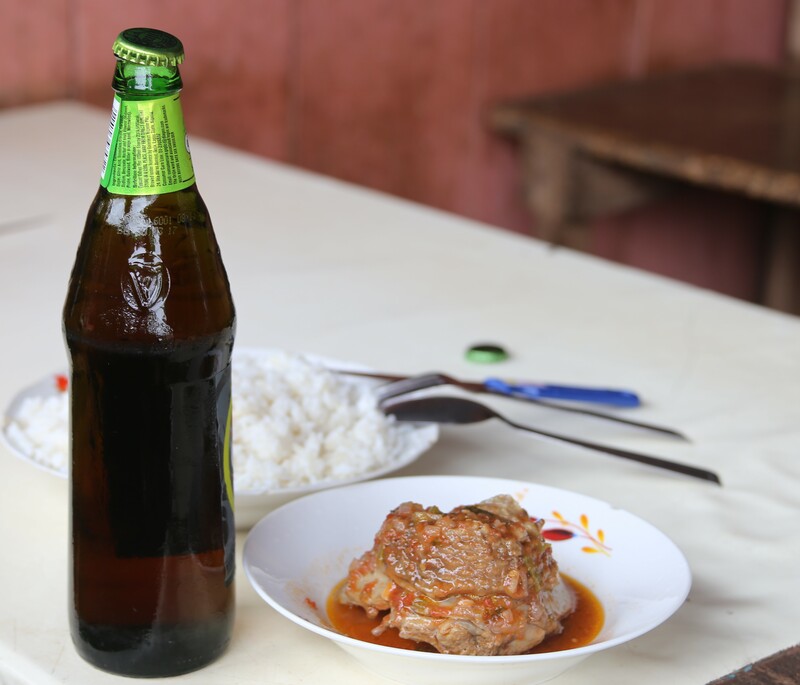 However, common places to find bush meat in major Cameroon cities such as Yaounde, Douala, Buea, Bamenda Kumba and other urban cities in the country are pubs where hawkers are allowed to sell peppered bushmeat. They are sold in small sizes at 200FCFA (USD$4) each. She also tells InfoCongo that with 10,000FCFA (USD$20), one can start the business. “If one buys a monkey for 8000FCFA (USD$16), pepper and spices for 2000FCFA (USD$4) and hawk for several hours a day, one will be able to sell everything in 3-days and make a profit of 5000FCFA (USD$10).” “Repeated many times, one can earn an income and make a livelihood out of that,” she says. “This business helped me build a house and send my children to school. 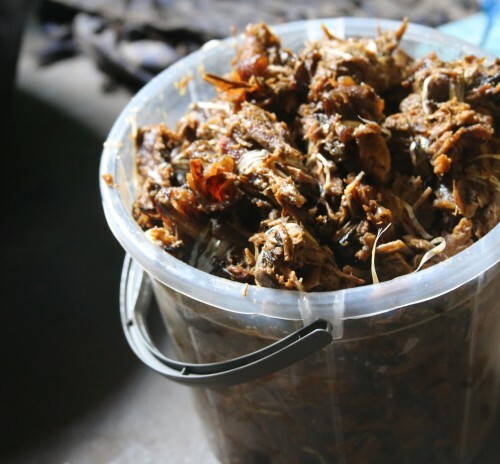 Some of them helped me in hawking bush meat during holidays, and that is how we have been surviving since my husband died a few years ago,” Mami Bushmeat says, adding that the only time she had difficulties was during the Ebola outbreak when the consumption rate dropped. Joseph Lekealem, Director of Wildlife at Cameroon’s Forestry and Wildlife Ministry admits the killing of endangered species for their meat and trophies thrives but notes that government is trying to fast track the fight against this phenomenon. He says besides the inclusion of the military in raids on bushmeat markets and poachers’ camps, the government has reinforced checks along the borders and at airports. 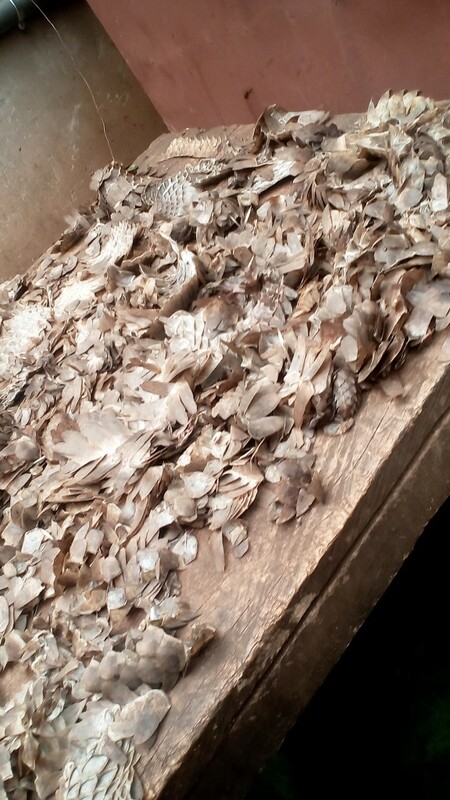 “We recently noticed a rise in the export of Pangolin scales and our guards are also keen on that. The export of the scales is forbidden,” he noted. "The government is trying to organize the bushmeat sector, but hunters are not cooperating." “We have made the acquisition of categorized hunting permits easier. With this, we should be able to allocate quotas for hunters and hunting zones. Then we have meat collectors who would normally work with hunters who kill trophies; these are the people who would collect the meat and sell legally, and we would have statistics of all the transactions.” he says. The Director lamented that most hunters don’t trust the system, and they prefer to operate illegally, killing every animal they can. However, government of trying to identify alternatives. "Government and conservation organization have introduced the methods of breeding wild animals for sale, such as porcupines," said Lekealem. Sales Ngachou, Chief of Community Management at the Ministry of Forestry and Wildlife says they are getting traditional rulers involved in the fight against illegal trade in bush meat and trying to get traders engaged in other income generation activities. She also said government organizes sensitization campaigns in communities and the mass media to educate citizens on the conservation of biodiversity. While the government is struggling to end the illegal trade in endangered species, some of its staff members are apparently working in the opposite direction. A June 2016 World Wildlife Fund for Nature (WWF) report shows a string of white collar poachers including local military, judiciary and administrative officials Involved in poaching and trafficking in endangered species, particularly elephant tusks. The report cites, Placide Ekel and Rodrigue Metindi, registrars of the Yokadouma High Court, who were sentenced for stealing seized elephant tusks and trying to smuggle them into Yaounde on October 10, 2015. The report also cites the case of the Divisional Officer of Moloundou who was involved in the theft of 49 out of 53 elephant tusks confiscated by officers of the Lobeke National Park. Several law enforcement officers are reported to be targeted in ongoing judicial investigations, says WWF. An anonymous source at the Ministry of Forestry and Wildlife told infoCongo traffickers have a lot of money and influence and always bribe their way through. He argued that buy-in to conservation messages depends on not only on preaching the benefits to future generations, but also allowing citizens derive direct benefits from their resources. “If that is done, no one would prefer eating a monkey when he knows how much he would benefit from its survival in the bush,” our source said.